Sunset Paradise is a magnificent beach front home located DIRECTLY on the Gulf of Mexico , mid-island in quiet Fort Myers Beach, Florida. Beautifully landscaped and decorated, Sunset Paradise provides a retreat with all the luxury and comforts of home. Stunning sunset ocean views enhance your meals from the dining room, and three different porches or patios overlooking the ocean. Catch your dinner of trophy snook, redfish, and trout right out your door. Or, just relax in your beach front hot tub enjoying the ocean breeze, and leave the fishing to the pelicans and dolphins, who will provide you with an aerial and aquatic ballet, as they search the Gulf for breakfast. Walk the miles of beach. Enjoy the thrill of beach combing for buried treasures and wading the sand bar at low tide in search of sand dollars, live shells, and giant starfish. The beach is one of the safest in the world with a very gradual drop off.... undertow or rip currents are very, very rare. Our home is decorated with tropical furnishings, tile floors, a modern kitchen, and all the conveniences of home including free wireless internet. With four bedrooms and four baths, Sunset Paradise comfortably sleeps and is limited to 10 people (8 adults and 2 children). The house is very child friendly with high chair, playpen/crib, and stroller available for your use. The 46’ private swimming pool is designed for all ages with both 6 inch and 2 foot deep wading areas as well as a six foot deep end. The entire pool and patio area is surrounded by a fence for the safety of little ones. The grounds are lushly landscaped to enhance your vacation privacy. Sunset Paradise is one of the nicest homes on Fort Myers Beach; a truly spectacular property. Our goal is to provide your home away from home and Sunset Paradise is designed to be luxurious at an affordable price. Thank you for not smoking in or bringing your pets to Sunset Paradise. In addition to bedding and bath towels, this includes beach towels. Large area for off street parking for multiple vehicles. No need to bring beach towels! Stunning sunset ocean views enhance your meals from the dining room, and three different porches or patios directly on the Gulf. Catch your dinner of trophy snook, redfish, and trout right out your door on one of the best surf beaches in Southwest Florida. The fishing is super in the spring, summer, and fall when Snook and Redfish congregate on the beach. Or, just relax in your beach front Hot Tub enjoying the ocean breeze, and leave the fishing to the pelicans and dolphins, who will provide you with an aerial and aquatic ballet, as they search the Gulf for breakfast. Walk the miles of beach. Enjoy the thrill of beach combing for buried treasures and wading the sand bar at low tide in search of sand dollars, live shells, and giant starfish. The beach is one of the safest in the world with a very gradual drop off.... undertow or rip currents are very, very rare. 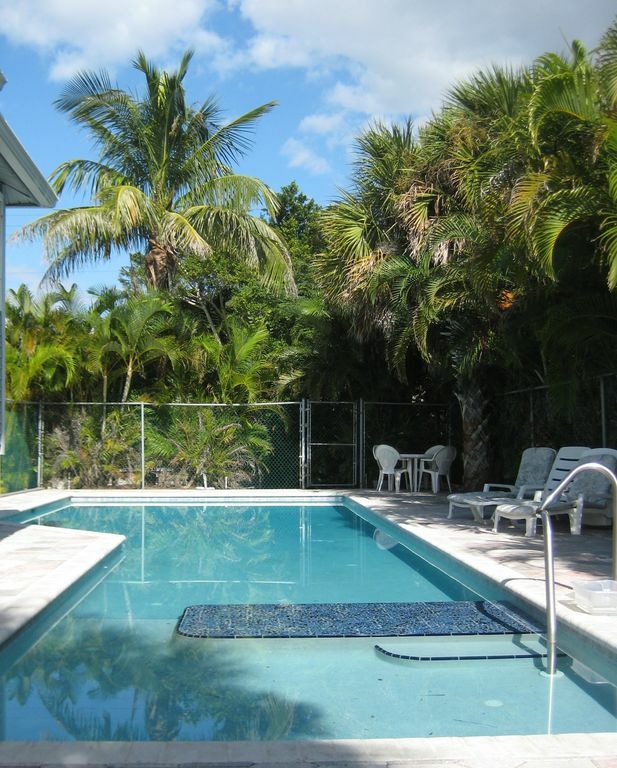 Sunset Paradise is one of the nicest homes on Fort Myers Beach; a truly spectacular property.